This article will aid you to remove Search-Private.com effectively. Follow the browser hijacker removal instructions at the end of the article. 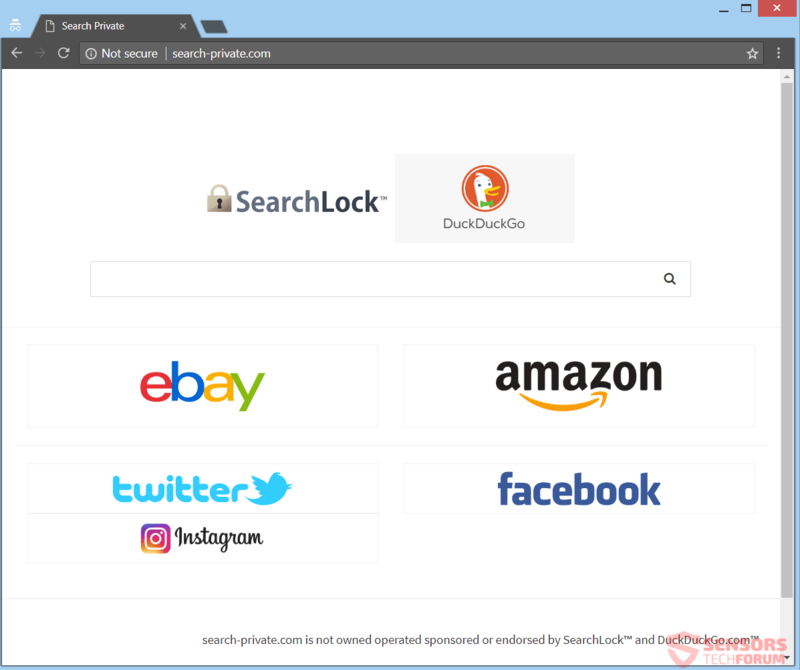 Search-Private.com is the official domain of the browser hijacker Search-Private. The hijacker can change the homepage, new tab setting, search engine of your browsers and set an add-on. The add-on is also available at Google’s Chrome web store. You might be redirected. Search results display adverts and could be incorrect or misleading. Short Description The homepage, new tab setting, and search engine of your browsers are changed. Symptoms Your browsers will have their homepage, new tab setting and search engine modified. A browser extension can be added. You will see ads and incorrect search results. User Experience Join Our Forum to Discuss Search-Private.com. You can get the related browser extension of Search-Private.com in a few ways. 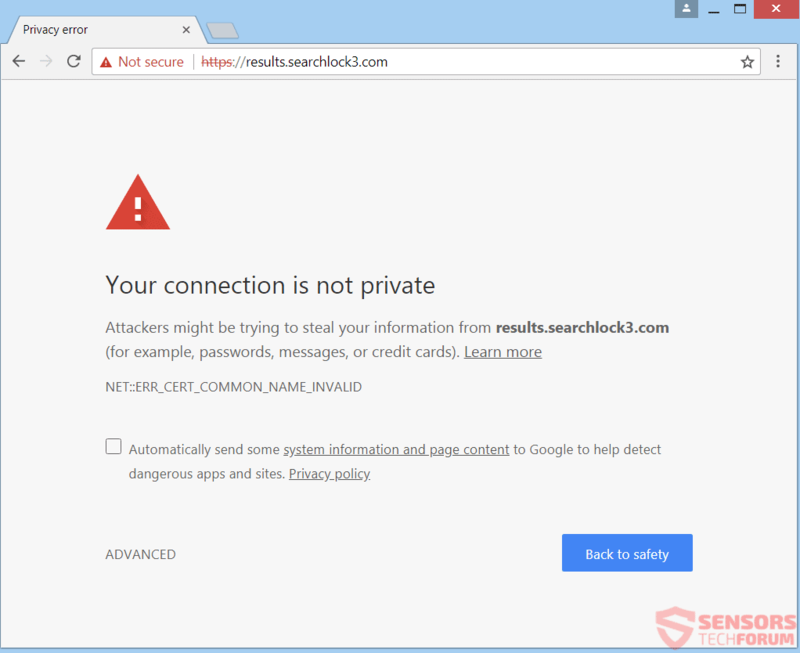 This server could not prove that it is results.searchlock3.com; its security certificate is from *.searchlock.com. This may be caused by a misconfiguration or an attacker intercepting your connection. A similar warning appears in Firefox and other browsers, but if you proceed to the page despite the warning, you will end up on a page with the URL “http://searchlock3.com/“. Entering any information there could be obtained from that SearchLock domain. To conclude, free installation setups and bundled packages could install some PUP that may redirect you to those domains. Additional components for installation are selected by default in such packages and you should deselect anything you do not want installed. Looking for a Custom or an Advanced option in a setup is a good way of preventing unneeded installations. Above you can see that there is even an extension related to Search-Private.com. It is offered at the Chrome Web Store and is helping it spread further. Another distribution method for the hijacker is via advertisements, like banners and pop-ups or from visiting sites that are unknown. Those sites can be partnered with the hijacker’s makers. Affected browsers are: Google Chrome, Mozilla Firefox, Internet Explorer and Safari, plus others. Note! 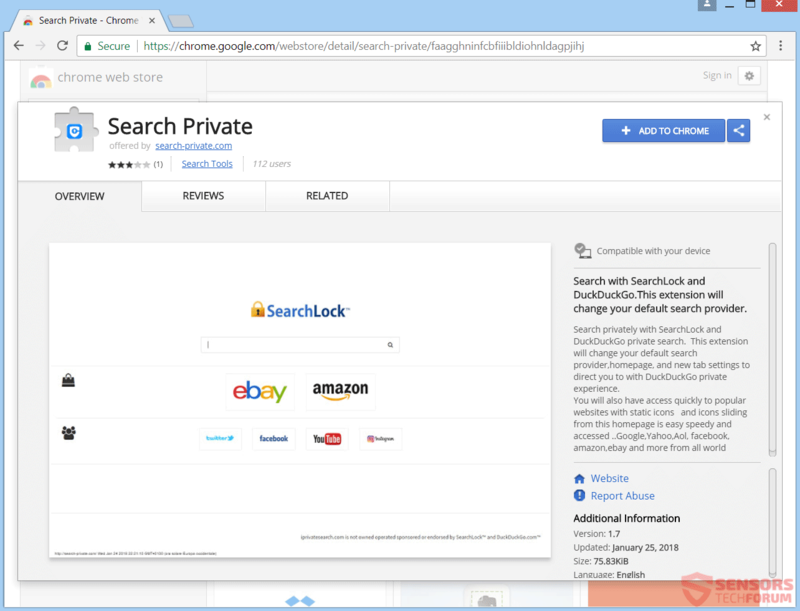 The extension seems to say Search Private (search-private.com) and if installed, you will see on its main page that it uses the same logos, design, and search engine as “SearchLock“. The search results go to the “results.searchlock.com” domain. 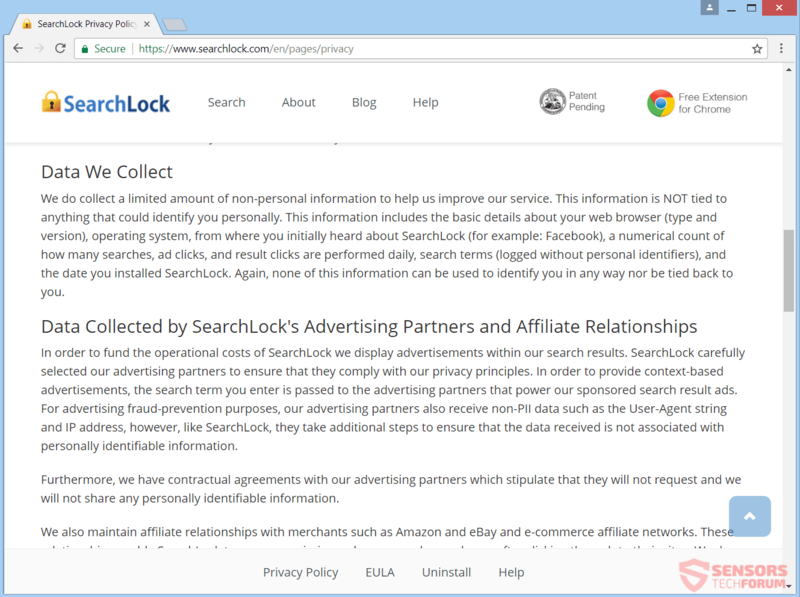 And although it says at the bottom of the main page “search-private.com is not owned operated sponsored or endorsed by SearchLock” it still uses their logo and search filter. True or untrue, in either case this is bad and somebody is definitely lying here. Search-Private.com is the domain of the browser hijacker of the same name. 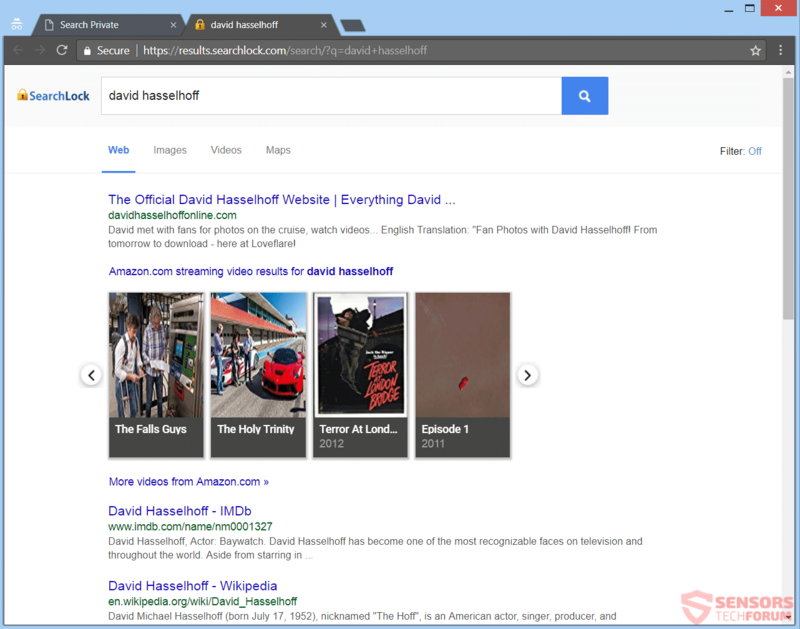 If Search-Private addon or extension is installed on your computer, you will see certain settings changed. Your browsers will have their homepage changed, as well as the search engine and new tab setting. It claims to be useful by making your searching private, but there is no evidence that is true. Instead, all information that you type in goes through the Search-Private/SearchLock domain. Browser redirects can come from the new tab setting, the homepage, or from advertisements. Pop-ups, pop-unders, banners or even in-text links might show as part of the adverts content. Sometimes, the user experience is different and close to the one received from popular search engines in terms of results. The redirects may have the goal to generate more traffic to domains which get money by pay-per-click, but that is not proven. To remove Search-Private.com manually from your computer, follow the step-by-step removal instructions provided below. If the manual removal does not get rid of this hijacker completely, you should search for and remove any leftovers with an advanced anti-malware program. Such software can keep your computer secure in the future. Threats such as Search-Private.com may be persistent. They tend to re-appear if not fully deleted. A malware removal tool like Combo Cleaner will help you to remove malicious programs, saving you the time and the struggle of tracking down numerous malicious files. Threats such as Search-Private.com may be persistent on your system. They tend to re-appear if not fully deleted. A malware removal tool like SpyHunter will help you to remove malicious programs, saving you the time and the struggle of tracking down numerous malicious files. Note! Your computer system may be affected by Search-Private.com and other threats. SpyHunter is a powerful malware removal tool designed to help users with in-depth system security analysis, detection and removal of threats such as Search-Private.com. 1. Install SpyHunter to scan for Search-Private.com and remove them. 2. Scan with SpyHunter, Detect and Remove Search-Private.com. Ransomware infections and Search-Private.com aim to encrypt your files using an encryption algorithm which may be very difficult to decrypt. This is why we have suggested several alternative methods that may help you go around direct decryption and try to restore your files. Bear in mind that these methods may not be 100% effective but may also help you a little or a lot in different situations. Note! Your computer system may be affected by Search-Private.com or other threats. 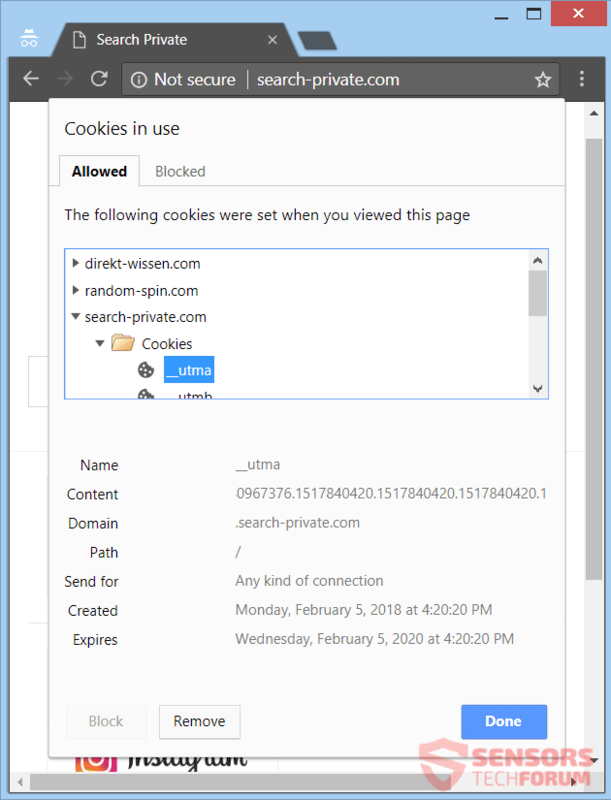 Remove Search-Private.com by cleaning your Browser and Registry. Fix registry entries created by Search-Private.com on your PC. Combo Cleaner is a powerful malware removal tool designed to help users with in-depth system security analysis, detection and removal of threats such as Search-Private.com. Step 5: In the Applications menu, look for any suspicious app or an app with a name, similar or identical to Search-Private.com. If you find it, right-click on the app and select “Move to Trash”. Step 6: Select Accounts, after which click on the Login Items preference. Your Mac will then show you a list of items that start automatically when you log in. Look for any suspicious apps identical or similar to Search-Private.com. Check the app you want to stop from running automatically and then select on the Minus (“–“) icon to hide it. Remove Search-Private.com – related extensions from your Mac’s browsers. A pop-up window will appear asking for confirmation to uninstall the extension. Select ‘Uninstall’ again, and the Search-Private.com will be removed. When you are facing problems on your Mac as a result of unwanted scripts and programs such as Search-Private.com, the recommended way of eliminating the threat is by using an anti-malware program. Combo Cleaner offers advanced security features along with other modules that will improve your Mac’s security and protect it in the future. Hey !, I found this information for you: "Remove Search-Private.com Redirect". Here is the website link: https://sensorstechforum.com/remove-search-private-com-redirect/. Thank you.